Ever tried making a quiz and thought “I’ll just Google some questions and answers, and have it done in less than an hour…”? Here at the office, we underestimate the time it takes to make a quiz every single time. … it’s always the same outcome: Results are crowded with low-quality, outdated and (usually) useless sites. Or would you elbow your way through something that looks like THIS? How? 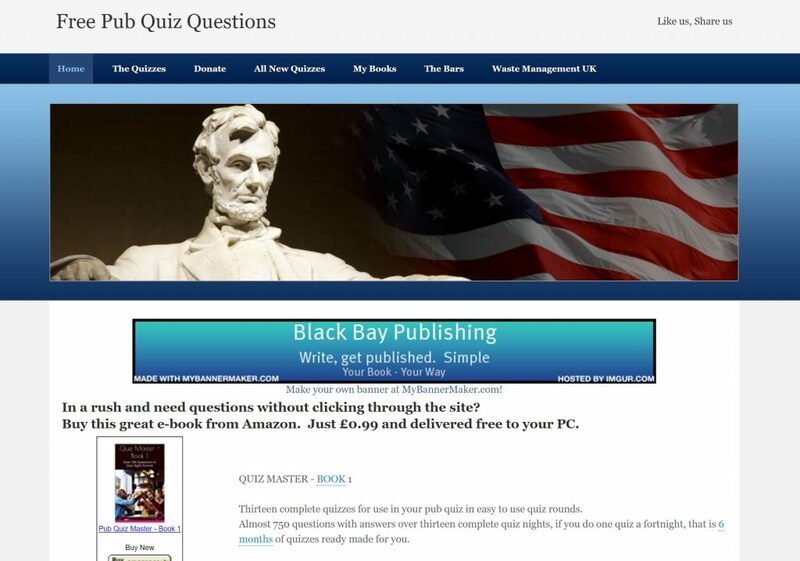 By creating a list of sites that offer a decent set of quiz questions and answers. To evaluate the number of quiz questions and the ease of lookup, I used a star rating ranging from one star (minimum score) to three stars (maximum score). That being said, I noticed that the difficulty level of the quizzes is generally quite high. When you use quizzes for marketing or entertainment, we advise to not make the quiz too difficult… You don’t want your participants to feel dumb or see them abandon your quiz early. 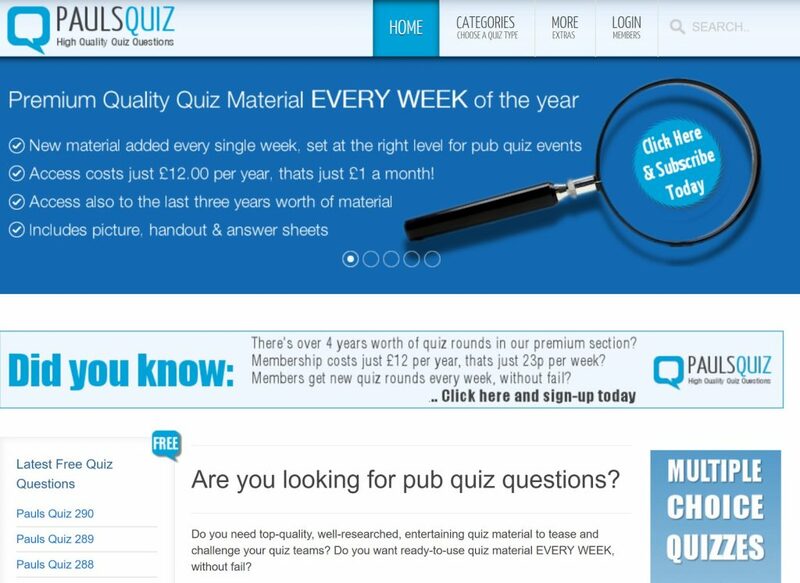 PaulsQuiz is an excellent site, offering plenty of quiz questions from a wide set of categories. You can look up quizzes and questions by category but also by keyword (e.g. “James Bond”). The site also has a Subscription membership option and premium (paid) quiz download packs. My personal favorite from this list! 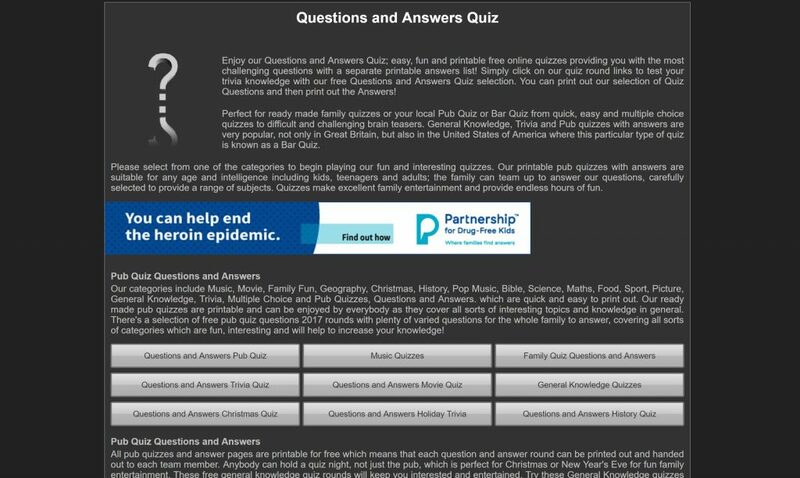 Pub Quiz Questions HQ offers a large number of quiz questions and answers, with a UK focus. The quizzes can be downloaded in pdf and there is a free Kindle book available containing all the General Knowledge questions. The focus on the UK specifically is not too prominent in my opinion, but I found the difficulty level of the questions quite high. 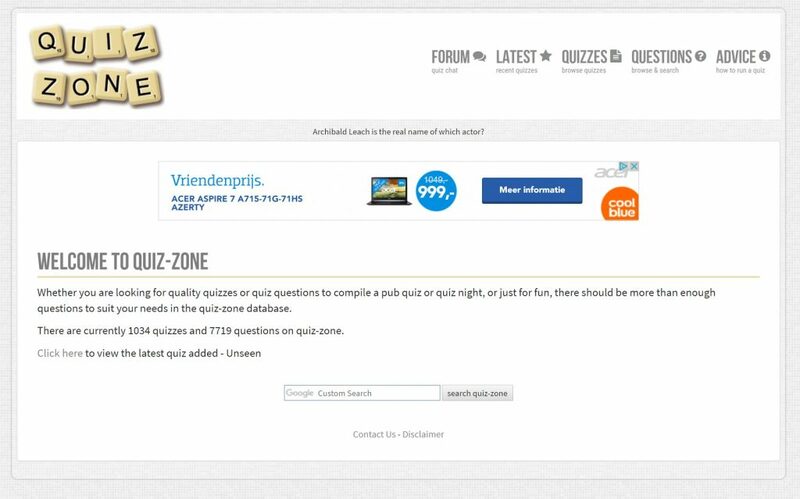 Quiz Zone is a well-designed quiz question site, with the possibility to browse quizzes as well as questions. The latter is useful when you want to compose a custom quiz yourself. The questions are categorized by difficulty level. Which is great! The site also has a forum which is actively maintained and has a lot of recent posts. 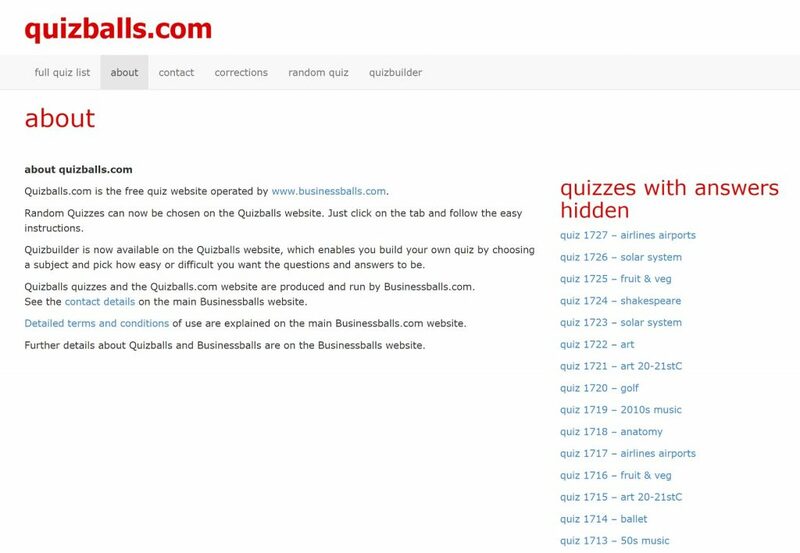 Quizballs has a kind of minimalistic design, but nevertheless, offers an extensive range of quiz questions about various categories. 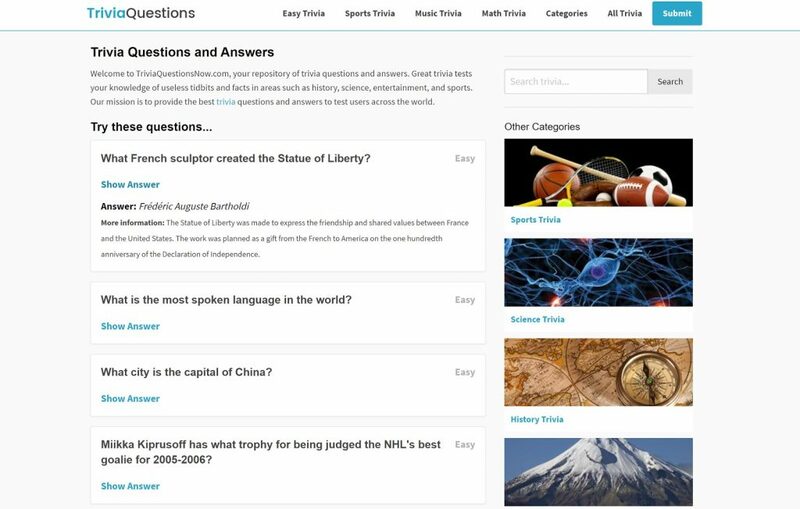 A very useful feature is their quizbuilder, enabling you to create a quiz with a difficulty level and subject of your choice. 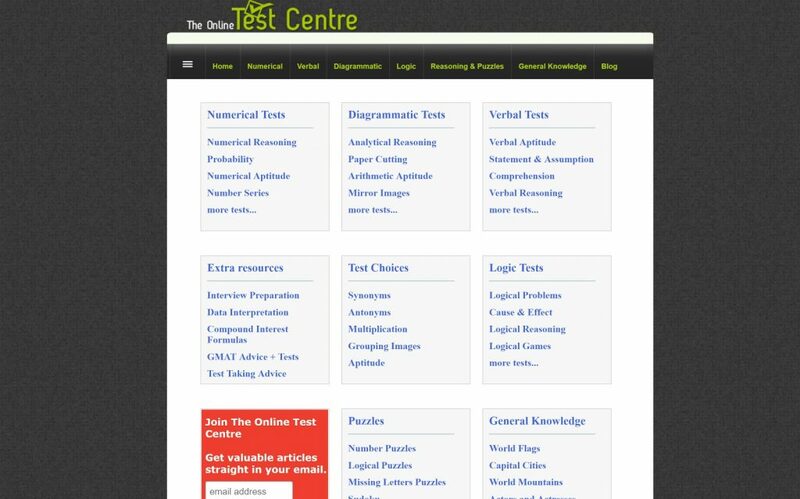 The Online Test Centre focuses on educational quizzes and tests, such as numerical tests, verbal tests, etc. It contains more extensive questions, requiring some level of reasoning. This is useful in a learning environment or when assessing candidates during the recruitment process. My personal favorite when you want to create educational quizzes! 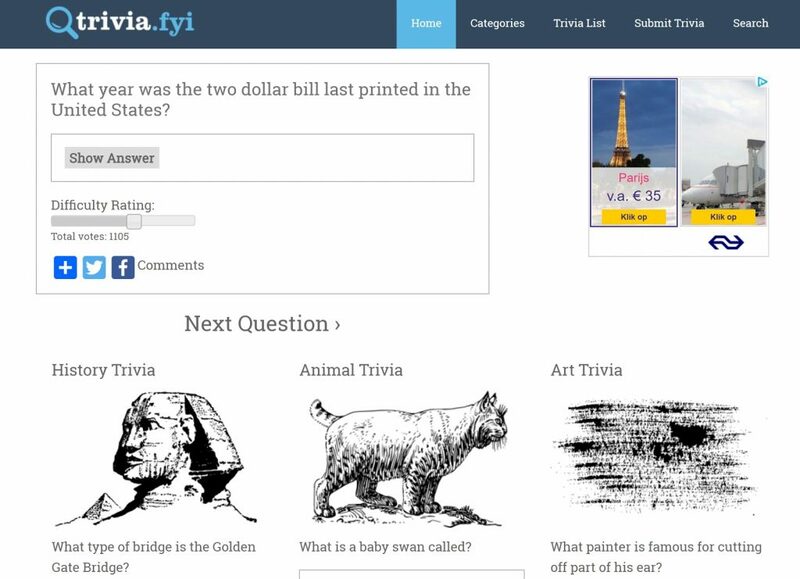 Trivia.fyi displays one question at a time in a specific category. This is useful for taking a quiz, but a bit cumbersome to simply browse the questions. An interesting feature is the user-generated difficulty level for each question. It is however not possible to search questions by difficulty level. Challengethebrain.com has a somewhat outdated design, but the site offers many different quiz question categories to choose from, including subcategories such as Movie Quizzes > Disney Movie Quizzes. A disadvantage, however, is that the quiz questions and quiz answers are on separate website pages. Trivia Questions has a modern design and a decent set of quiz questions, categorized according to the difficulty level. An interesting feature is that you see additional information about the answer (‘More Information’), while most other sites just display the correct answer without explanation. 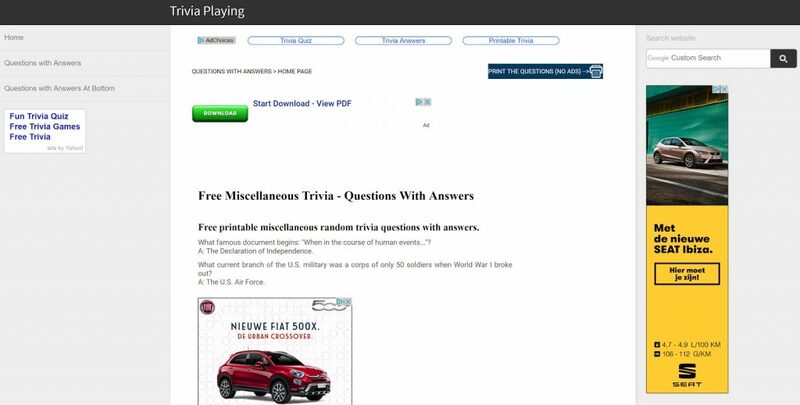 Although Trivia Playing is not the most user-friendly site in the list (there are ads all over the site), it contains a huge set of quiz questions about every subject you can imagine. The difficulty level is medium in general, but there is also a category ‘Easy Trivia’. Those are my top 10 resources for when you need to find quiz questions and answers. I hope this list makes it easier for you to easily look up quiz questions and answers for your own quizzes. And now, if you’ve got a set of questions and are ready to create your quiz, give it a try with our step-by-step guide on how to make a quiz. 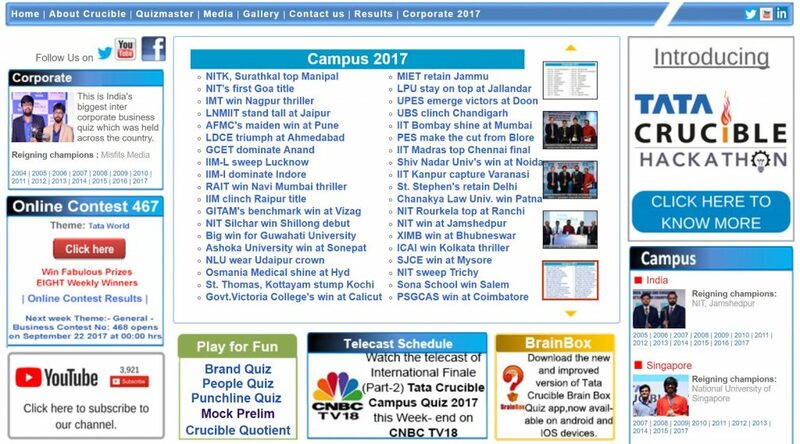 Any other quiz sites that should be added to the list? 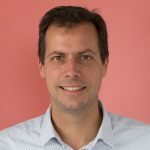 As the CEO of Survey Anyplace, Stefan focuses on how to get the best results from the tool - preferably backed with real-life data. mmmmmmm mmmmm thats good lets see what your application will do? Try Ken's Quiz as reference site for quiz questions, I've always found this site excellent as it has easy, medium and difficult modes, as well as having a random generated quiz. He has so many categories listed with a vast array of topics to choose from, and has new quizzes added every month. In my opinion it is for me a quizmasters dream come true.